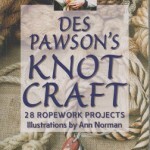 This knot according to Ashley’s Book of Knots is more commonly used in the East for tying up river boats. 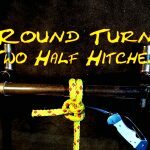 This really is a lesser known hitch, and maybe even more so in this day and age. I recall being in Singapore and Hong Kong in the the 70’s and again in the 80’s, when the waters around were filled with all kinds of vessels. There were whole villages made up of boats tied together. 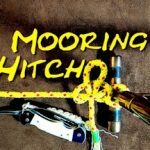 You will see from the video that I show two ways of tying the Sampan Hitch. 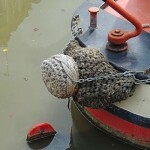 One directly attached to the mooring ring. 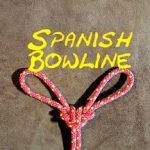 Then a second variant where the rope is passed through the mooring rind and then the actual knot is tied on the deck of the moored vessel. One comment on the YouTube channel thought that the Sampan Hitch was used to hold the tiller over whilst the vessel was moored up? 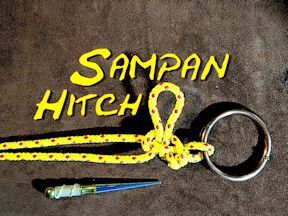 If you have first hand experience of the Sampan hitch, then please do leave a comment below on this blog post or on the YouTube Channel. Obviously the problem with all quick release hitches, is that they can easily be accidentally released. 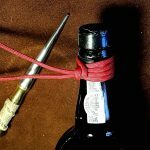 However, by inserting a toggle or putting the working end of the rope back through the bight, does offer some additional security.